Since returning to his hometown in 2008 to join the Civic Orchestra of Chicago, violist BENJAMIN WEBER has performed chamber and orchestral music across the region. 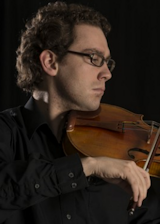 He serves as Principal Viola with the Rockford Symphony and Assistant Principal with the Illinois Philharmonic. In the past, he’s performed with the Rochester Philharmonic, New World Symphony, Elgin Symphony, Madison Symphony, New Millennium Orchestra, Access Contemporary Music and the Palomar Ensemble. In September of 2013, he appeared with the Kontras Quartet and the Kruger Brothers with Steve Martin on the Late Show with David Letterman. He is on faculty at the Merit School of Music, and has a small private studio.